The Polemicist: Keep on Truckling: Mayor of New York's Job "is to be a defender of Israel"
To be sure, it's his political base and his political ideas that have brought Lieberman to the inner circle of the Israeli government. As Max Blumenthal points out, in his book Goliath, Lieberman and his party, Yisrael Beiteinu (Israel Our Home), represent the "post-Soviet class of Russian immigrants who arrived in Israel with at best a tenuous connection to the Jewish religion, little understanding of the country’s history and no warning that over a million indigenous Palestinians also lived as citizens in their new country." It's a constituency that rejects "the cultural and political norms that defined the leadership of the traditional Ashkenazi elites of Labor and Likud," and Lieberman is a politician that "meld[s] authoritarian populism with a distinctly anti-clerical strain, appealing to anyone who loathed the presence of Muslims, radical leftists, and the ultra-Orthodox." In a provocative gesture of contempt for Palestinians, as well as for international law and liberal opinion -- a stance that only further endears him to his constituency -- Lieberman resides in an illegal settlement. In other words, as Juan Cole puts it, Lieberman is a "far, far right nationalist" who, "if he were a European politician would almost certainly be considered too far right to be legitimate." I argued in the book that Nazism was not a specifically German disease, that in certain circumstances any country in the world could be infected by this virus – including our own state. In order to avoid this danger, one had to understand the underlying causes for the development of the disease. ..
For years I have avoided dealing with this subject. But it is true that I carry in my head a little red light that comes on when I sense the danger. Can Lieberman, or someone who could take his place, turn out to be a demonic personality like Hitler, or at least Mussolini? And the belief that we are a “chosen people” is already deeply rooted. These indications may not necessarily lead to disaster.. So, in 2009, critical Zionists in Israel denounce Avigdor Lieberman as a harbinger of Israeli fascism, a potential new Hitler or Mussolini. In 2014, Bill de Blasio, the progressive mayor of New York City, welcomes Lieberman with eager fealty, because Lieberman now represents an entrenched and dominant strain of Zionist politics -- that which it is the PEP mayor's job to defend. And how will progressive New Yorkers respond? Can you believe that Chris Christie?! OMG, a traffic jam on the George Washington Bridge! Or can we do better? Lieberman called for all Palestinian prisoners held by the Israeli occupation authorities to be drowned in the Dead Sea and offered to provide the buses (“Lieberman blasted for suggesting drowning Palestinian prisoners,” Ha’aretz, July 11, 2002). He has proposed to strip the citizenship of, and expel any Palestinian citizen of Israel who refuses to sign a loyalty oath to the Jewish Zionist state (“A Jewish demographic state,” Ha’aretz, June 28, 2002). In 2002, Lieberman declared, “I would not hesitate to send the Israeli army into all of Area A [the area of the West Bank ostensibly under Palestinian Authority control] for 48 hours. Destroy the foundation of all the authority’s military infrastructure, all of the police buildings, the arsenals, all the posts of the security forces… not leave one stone on another. Destroy everything.” He also suggested to the Israeli cabinet that the air force systematically bomb all the commercial centers, gas stations and banks in the occupied territories (The Independent, March 7, 2002). There seems to be an element of this encounter that indicates it is something beyond a pro-forma gesture on the part of de Blasio. If you notice the credit beneath the picture above, it's to Bill de Blasio himself. Here's the full credit for the photo, as I found it on Wikimedia commons: "By Bill de Blasio [CC-BY-SA-2.0 (http://creativecommons.org/licenses/by-sa/2.0)], via Wikimedia Commons." So, not taken by the press, this would seem to be a photo for the de Blasio collection. Perhaps he'll spend a cozy evening with Chiara and Dante, perusing his photo books: Here, kids, are the people I work for and defend. Here is what my job is about. 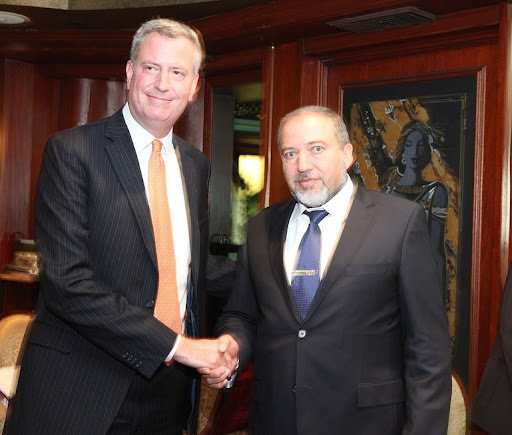 Bill de Blasio shaking hands with Avigdor Lieberman today is not much different than the mayor of New York shaking hands with Willem Botha in 1986, and no less in contradiction with any "progressive" pretensions. (Actually, it would have to be someone like Johannes Vorster to complete with Lieberman!) 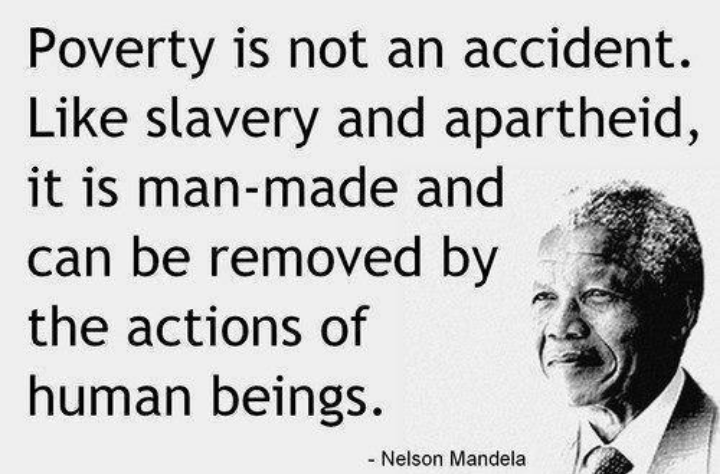 There are many progressive Americans and New Yorkers who understand that, and more every day. Most of those who do not yet, will, sooner than they think. AIPAC's/de Blasio's attempt at keeping the public's eyes out of this meeting is, I think, symptomatic of the increasing discomfort that's in the air, even in New York, with this kind of toadying to Israel. If he's so proud of defining his job as defending Israel, let all New Yorkers hear. and see. him say that. 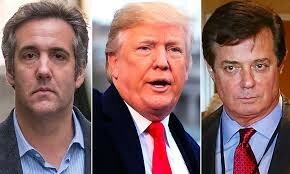 But what's happening is the kind of disconnect between what can be said to the voters and what must be said to the donors, a disconnect that's getting harder to hide. As with Romney at his private donor party in 2012, de Blasio's task at the Hilton was not to worry about the increasing percentage of his constituency who do not think defending Israel and AIPAC is part of the job description of the mayor of New York City. The lobby is structural. Bill de Blasio went to Nicaragua to support the Sandinistas and he hates racism and he can spend political capital to fight for economic justice and scrimp on snow-removal on the Upper East Side, but: he’s hamstrung on this issue. The most progressive forces in the U.S. have been corrupted by the Israel lobby. The most left-leaning/realist public figures one can imagine getting into important offices, from Barack Obama to Bill de Blasio to Samantha Power to Chuck Hagel, and they have no choice but to truckle to the lobby, because the lobby is so enmeshed in our (political/financial/media) Establishment, and because the party needs the money. It’s that simple. 1"de Blasio tells AIPAC his 'When you need me to stand by you I will answer the call happily, because that's my job'," at Mondoweiss . Juan Cole, "Will Avigdor Lieberman's return as Israeli Foreign Minister scupper Talks with Palestinians?,"
Neve Gordon, "Avigdor Lieberman, Israel's Shame." See also my post on Blumenthal, "Dropping a DIME: Max Blumenthal and the Erosion of Liberal Zionism." 3Ali Abunimah, "World silent as fascists join Israel government" at ElectronicIntifada. 4On Israeli Fascism: A Little Red Light" in Counterpunch. Very, very frightening. Who can escape the Zionist tentacles and survive? Zionism is a form of European colonialism and white supremacy. 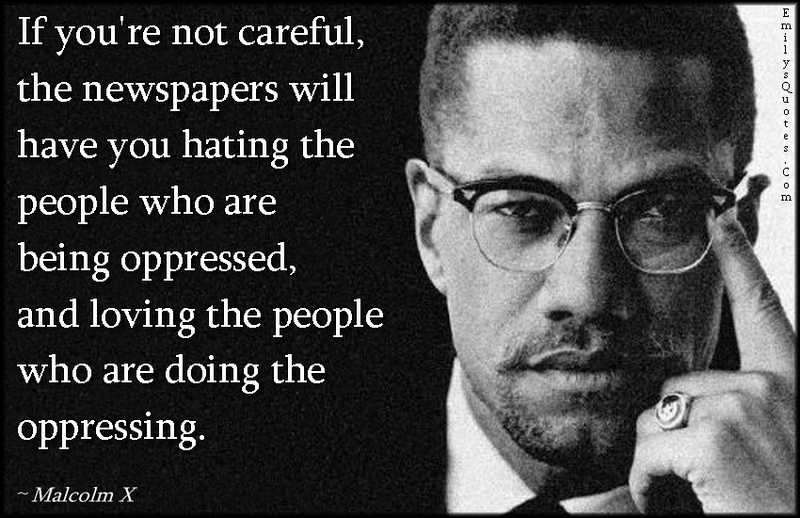 The Zionist were the greatest supporters of the apartheid government of South Africa. They assisted the Afrikaners in their development of a nuclear bomb giving them the ability to kill millions of Africans. AIPAC is a parasite on the American political body. It's goal is to drain our country dry of money and force the American people to fight wars for the apartheid state of Israel.